There are occasions when you may need to smooth out a surface and a scraper won’t do the job. 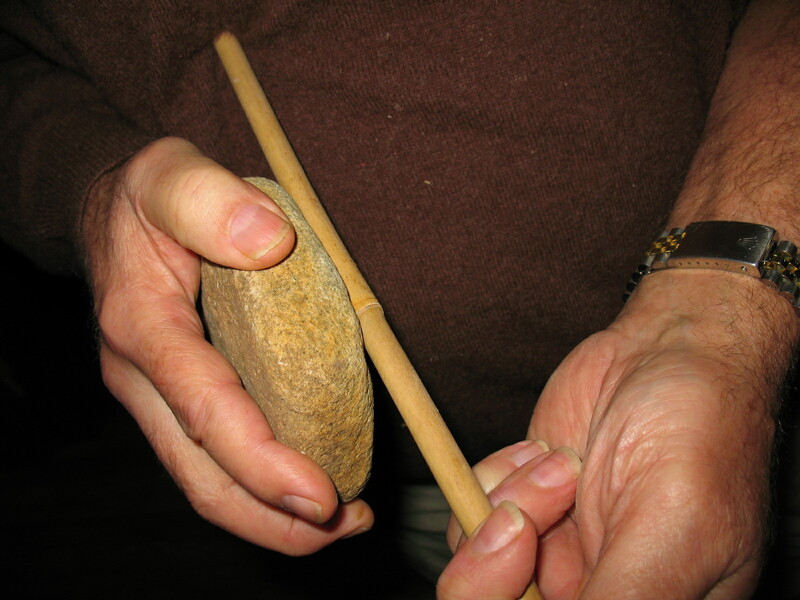 You might, for example, be trying to remove the joint ridges from a cane arrow shaft. If you use a scraper to do this you will find that the scraper wants to remove material from the area between the joints as well as from the joint ridges. 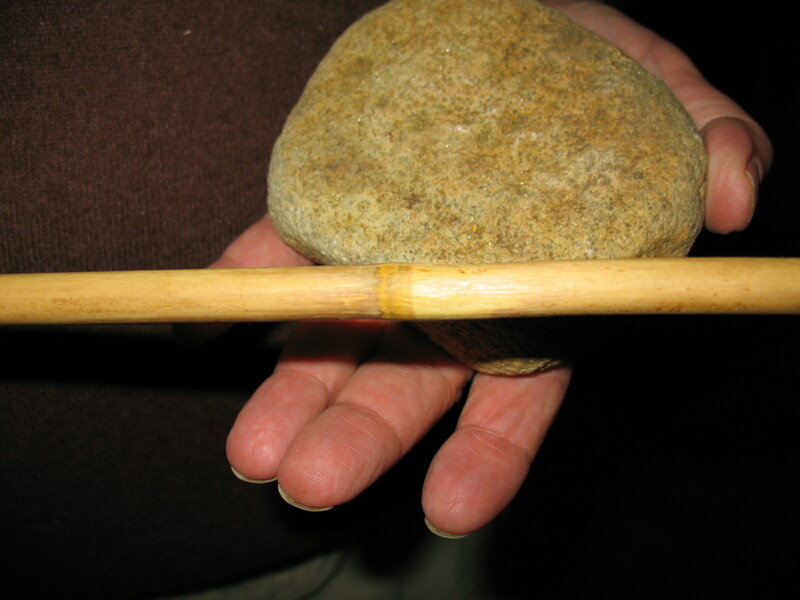 If you use a sandinging stone you will be able to sand the ridges down so that they are even with the surrounding material, and you will end up with a nice smooth arrow shaft. 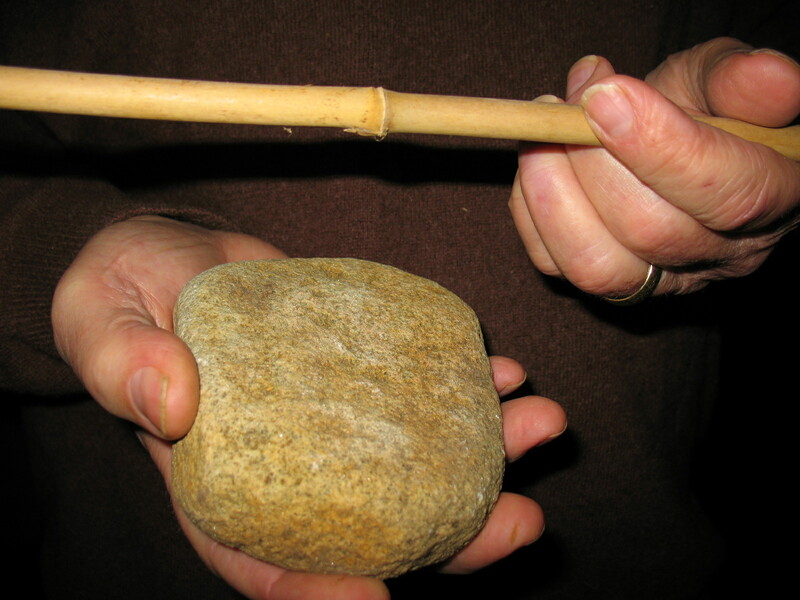 Pictured below: top, sanding stone and cane shaft with rough joint; middle, using sanding stone on joint; bottom, sanding stone and smoothed out cane joint. You really don’t have to make any kind of modifications in order to “make” a sanding stone; you just have to carefully select the right stone for the job. If you can find some river rocks you will probably find several that will make good sanding stones. Select several stones that are hard and have a fairly flat surface on one side. Look for various different degrees of coarseness in the stones. A coarse grade stone that will remove a lot of material can be used to rough out materials. Finer grades of stones will give you a smoother finish. If you can’t find hard river rocks like granite, or basalt; softer rocks, like sandstone will work but not as well. Sandstone will work on wood, but it will not work very well on bone. 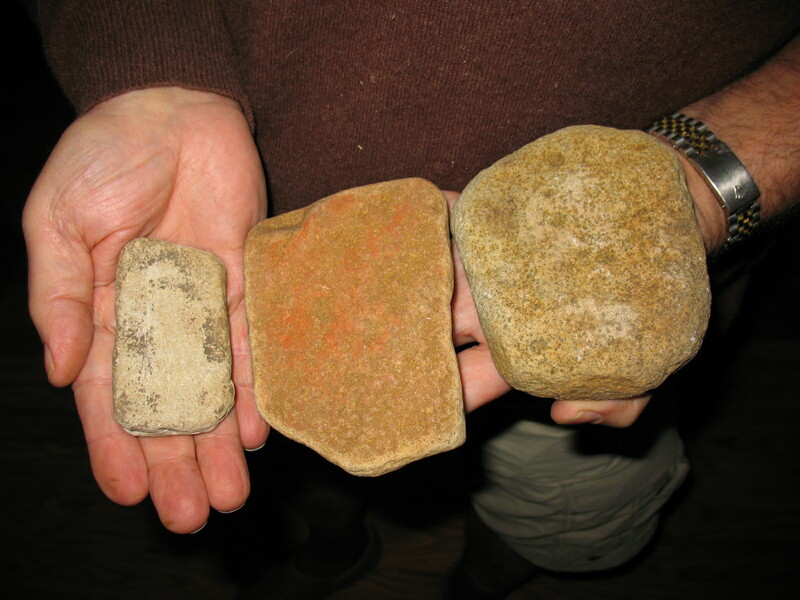 Pictured below, three different grades of sanding stones. Sometimes you will want to give a very smooth and hard surface to something that you are making, like a hardwood arrow shaft. You can achieve this super smooth and hard finish by a process called “burnishing”. A piece of smooth bone is one of the best burnishing tools that you can use. If you can find a good deer leg bone, that’s all you will need. You don’t have to modify the bone in any way. Pictured below: Deer leg bone and hardwood shaft. 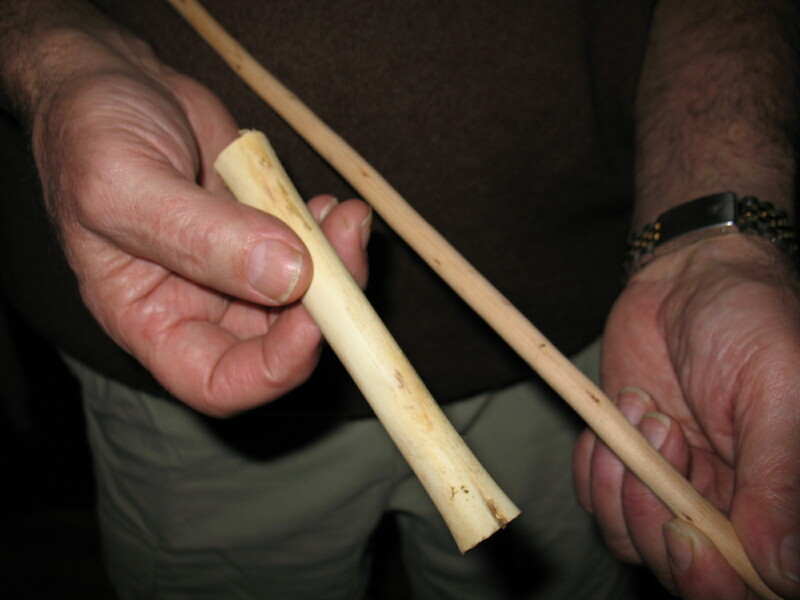 To burnish an arrow shaft you take the bone in hand, press it down hard on the wooden shaft, and rub. This will compress the wood fibers and give you a hard shiny surface on your arrow. This is important on an arrow because it creates a smooth surface to slide across your hand, and because the surface is harder it will be less vulnerable to nicks and scratches. 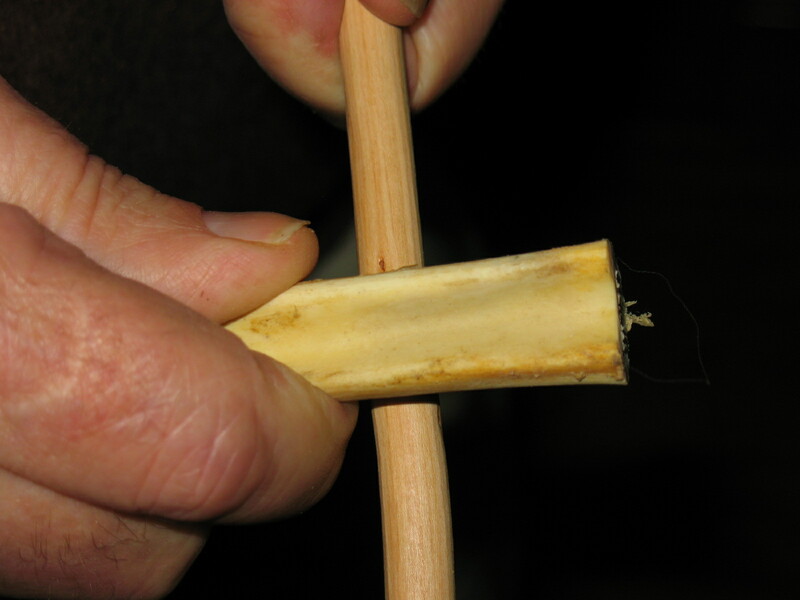 Pictured below: Using bone to burnish hardwood shaft. Great post, sanding is one thing a lot of bushcraft, survival, and primitive skills websites seem to ignore for some reason. What species of stone are you using?